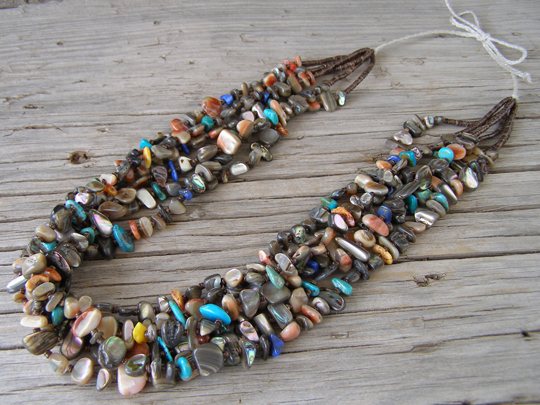 This six strand necklace is richly strung with a colorful mix of beads made from a variety of materials, including Kingman turquoise, red, orange & purple spiny oyster, lapis lazuli and wonderfully iridescent abalone. Fine-diameter heishi made from baby olive shell is incorporated in the strands as spacer beads between the larger, colorful beads and this makes the strands more supple in their movement. In traditional fashion, the braided beading string is simply tied off in a bow and no metal hardware is used as a catch. Length of the necklace cited below is the measured length at which it is tied in the photographs, but this necklace could be tied at any length from 20" to 34". A beautiful mix of color strung to yield six silky strands. Length (as tied in photos): 25"